Välkommen till ett kapitel ur e-boken Katastrofutredning. (Detta kapitel är skrivet på engelska men svensk översättning kommer så småningom). The SPF 'reference group' met on 29 May 2002 to review developments (SPF dnr. SPF E 26/02). Present were Katrin Berggren, Disa Byman, Mats Ekdahl, Göran Stütz, Göran Lindmark, all SPF, Magnus Faxén, Lasse Johnsen, Hans Landberg, Odd Lundkvist and Anna Carin Wallenstein. All the above persons have been informed about the findings in this book and the request that these new facts shall be considered but nobody has had the courtesy to reply. The writer evidently had met the SPF on 24 April 2002 (see the previous chapter). The SPF director general Mats Ekdahl informed that the printed material of the 'fact bank' consisted of about 75-100 shelf meters of documents. The cost to digitalize these documents (for presentation on the Internet) was estimated at SEK 1-2 millions. Ambassador Magnus Faxén informed that he had made an inventory of the material of the Swedish Foreign Office (Utrikesdepartementet) together with Disa, the Swedish Board of Accident Investigation (Statens haverikommission) together with Disa, the Swedish Radio, the Swedish Television and the Swedish Board of Sound and Picture (Statens arkiv för ljud och bild). Disa Byman informed that she had completed the inventory of material from the Swedish Board of Accident Investigation (Statens haverikommission), the Swedish Maritime Administration (Sjöfartsverket), the Board of National Police (Rikspolisstyrelsen), the Swedish Foreign Office (Utrikesdepartementet), the Ministry of Transport (Kommunikationsdepartementet) and that she was still completing the inventory at the AgnEf, the Ministry of Trade (Näringsdepartementet) and the Secretariat of the Government (Statsrådsberedningen). Inventories of material remain to be done of the SEA and other associations of relatives, the Ministry of Justice (Justitiedepartementet), the Ministry of Social Affairs (Socialdepartementet), the Stockholm Police, the Office of the Stockholm Public Prosecutor, the Ersta hospital, the material of the Group of Analysis (at the National archives), the National archives, the Board of Social Affairs (Socialstyrelsen), the Board of Promotion of the Arts (Konstfrämjandet), the National Maritime Museum (Sjöhistoriska museet) and the Swedish Church. The reference group was told that material subject to the Swedish laws of secrecy, SL 8:6 and similar, still not made public, should be listed in the inventory with an explanation why it was still secret. Why any material about the 'Estonia' sinking was still secret was not given. The SPF had not asked for an inventory of any information or material from the Swedish Ministry of Defence or the Coast Guard (unless it was kept by the Maritime Administration). No inventory of material from shipping companies assisting at the accident was considered. However, it was discussed what to do with any material from Estonia, Finland and Germany. All associations of relatives and survivors had been given information about the 'fact bank' and asked to suggest material for the future web site. Nobody suggested that all essential information of the Commission about the accident itself was 100% false. The show must go on. The SPF advised that the whole work of the 'fact bank' must be objective and open so that the 'fact bank' should be trustworthy. The SPF thought that the 'structure' of the 'fact bank' could be finalized during 2003 and that a working, but not complete (all material contradicting the official course of events shall be censored? ), web site could be ready in September 2004 - 10 years after the accident. The work to complete the web site will then continue. Later somebody only has to run the web site - the 'fact bank'. The SPF shall discuss with the Ministry of Trade about the cost of and payment for the development of the 'fact bank' during 2003 and 2004. The Ministry of Trade has evidently 1998-2002 received all information in this book and filed it somewhere ... and later told the public that no new facts have been presented contradicting the Commission. How was the 'Estonia' filled with Water at the end of the Accident? On 29 May 2002 the reference group also discussed the task given to the SPF on 19 April 2001, i.e. 13 months earlier, that "the fact bank shall contain 'one example that, based on the sequence of events of the Final report (sic), describes how the 'Estonia' was filled with water at the end of accident'. The SPF informed that it could not formulate how the task should be defined and added that it could not advise who was going to carry out the study. This is stupid. The government ordered the SPF 19 April 2001 to provide 'one example that, based on the sequence of events of the Final report (sic), describes how the 'Estonia' was filled with water at the end of accident'. If the SPF cannot do it, it should advise the government. The SPF added that its job was only to transmit information. Isn't providing'one example that, based on the sequence of events of the Final report (sic), describes how the 'Estonia' was filled with water at the end of accident' transmitting information? But for 18 months the SPF didn't ask anybody to do the job. Admiral Frank Rosenius (sic - where did he come from? ), now consultant to the SPF, proposed that somebody makes a pre-study before anybody (who?) takes on the real job. The reference group then agreed that the SPF must split the two tasks, 'fact bank' and 'water filling', to be carried out simultaneously. And in order to increase the objective judgement of how the 'Estonia' was filled with water, the reference group suggested the possibility that the 'water filling' task was carried out abroad! "... e.g. 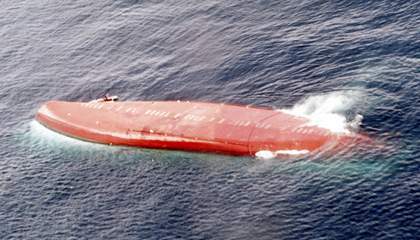 many questions are raised about the actual sinking at end of the accident (the final part of the sinking sequence). Therefore the SPF fact bank will contain material about this matter. The information I have indicates that the fact bank shall be completed next autumn (autumn 2002). It will not be a shortsighted work but something that I am convinced about will exist as long as I live and breath. The fact bank of the 'Estonia' is something the whole nation needs to have access to and to learn from and about." "... On the contrary there are many thoughts about the actual sequence of the sinking, how the water got in, when, through what doors, through what windows and through which valves (portholes). There are thousands of variations of the sequence of sinking, which we, through research - the government now gives money for that - want to learn more about." As a matter of fact the Swedish government gave 2000 the Swedish research board Vinnova SEK 25 millions to find out some variations why the 'Estonia' sank and that money was spent 2002, when the government gave another SEK 20 millions (sic) to Vinnova for further research (sic). But there are no results whatsoever of these SEK 45 millions in research grants. All the money went into the pockets of various people involved with the 'Estonia' cover-up or scam 1994-1999. Ms Mona Sahlin says there are thousands of variations of the sinking - the last 20 minutes of untold horror - based on the initial 15 minutes of events that are the official Truth; the superstructure filling up with 4 000 tons and the deck house with 14 000 tons of water. The SPF should only present one example how the 'Estonia' sank! One example why the 'Estonia' didn't capsize and float upside down. The inventory of the fact/information bank is not completed. One objective of the inventory was to get an overview of the amount and the character of the material. It was clear early this spring that the information bank was not going to be ready during the year 2002, but first at a later date. An exact time is difficult to state at present. The purpose of the information bank is to contribute getting answers to different questions raised. The work continues in dialogue with the government and the group of reference. The work of the inventory has given an insight how large and complex the Estonia material is. The question to provide 'an explanation that, based on the sequence of events of the Final report, describes how the 'Estonia' was filled with water at the end of accident' has not been dealt with. Other questions should be put directly to the concerned party outside the SPF. This was a strange announcement - the water filling question had been discussed on 29 May but on 26 August it had not been dealt with? We at the SPF estimate that the Estonia material, excluding media material from news papers, radio and TV, comprises about 75-100 meters of book shelves. Each shelf meter is roughly estimated to contain about 5 000 "papers". No electronic inventory exists. The work of inventory is not yet completed. The complexity of the material is due to its heterogeneous character; formal investigations, PMs, letters, films, pictures, sound recordings, etc. In the project description of the government there is no specific date when the work shall be completed. The question how the plot of dr Huss shall be handled cannot be answered at present. The SPF has no documentation how other maritime administrations regard the Final report. It is possible that such information may be included in the future information bank. It is good to know that the falsified plot of dr Huss is discussed by the SPF. When, how, by whom? It is an interesting task - shall the 'fact bank' contain false information? The SPF reference group met again on 10 October 2002 with the following persons attending (ref. SPF E49/02): Mats Ekdahl, Göran Lindmark, Katrin Berggren, Vendela Dobson-Andersson, all SPF, the SPF's "experts" Magnus Faxén, Hans Landberg, Frank Rosenius and Disa Byman, Mr Odd Lundkvist, AgnEf, Mr Lasse Johnsen, SEA, Ms Anna Carin Wallenstein, FAE and Mr Michael Öun, Neptunus,. Mr Keith Wijkander and Ms Jenny Rosenius, Sjöhistoriska Muséet, participated during the question where to put the bow visor. The first question was (10 October 2002) how the SPF followed recent 'Estonia' questions. Göran Lindmark, director general of the SPF, advised that the SPF tried to follow the various questions. Even if most time is used for the fact bank, the SPF tries to be a´jour with what happens and is written about the 'Estonia', Mr Lindmark stated. The SPF uses media watch services and its contacts with associations of relatives, authorities and interested private persons. The SPF welcomes tips about articles and other information about the 'Estonia' to be made available for the fact bank. The SPF has started to write an introduction to the various parts of the fact bank and to develop the structure of the fact bank, Lindmark concluded. However, the SPF was totally unaware of the fact that on the 10 June, 2002, the Estonia Litigation Association, ELA, had been established at Gränna, Sweden and had asked the Swedish prime minister Göran Persson by letter of 12 June to decide the establishment of a Truth Commission to simply find out the real reasons what caused the sinking of the 'Estonia'. These events were totally censured in Swedish media and the government office never recorded the receipt of the official letter. Thus, by 10 October, 2002, the government had never replied to the ELA letter. As a consequence the ELA was not invited to the SPF 'Estonia' meeting. The SPF informed that it had a good idea about the material from, e.g. the Board of Accident Investigation (Statens Haverikommission), the Maritime Administration (Sjöfartsverket), the police, the Foreign Office (Utrikesdepartementet) and partly from other media. The inventory of some material remains. However it was clear that all the complex material should be available in the 'fact bank' on the Internet. Also the relatives' associations have collected a large material that the SPF shall present. The FAE has already handed over its material to the SPF. Recently Ms Disa Byman, who works for the SPF, has looked at the archive of the AgnEf. Mr Lasse Johnsen said that the SEA had appointed a group to collect its material to be given to the SPF. The SPF has appointed an archivist to direct the work to systemize, register and digitalize the material of the fact bank. He starts in November, 2002. The SPF cooperates with the Swedish National Archives (Riksarkivet) that has good competence to handle large amount of information (1000 times bigger than the 'fact bank'). Available systems and software will be used, e.g. the so-called ARKIS 2 system that is used since long. The SPF estimates that it can present a prototype (sic) of the future fact bank during 2003. The objective is to have a working, but not complete, fact bank by September 2004 (the 10th anniversary of the sinking). As advised in May the work to complete the fact bank will take several years. The SPF announced that the consultant to the reference group, admiral Frank Rosenius, had been appointed to make a pre-study about how the 'Estonia' hull was filled with water at the end. The purpose of the pre-study is to clarify the conditions how a possible principal study shall be carried out. The simple question is: how could a ship with 4 000 tons of water in the superstructure and with 14 000 tons of water in the deckhouse at 01.32 hrs sink at 01.52 hrs without capsizing/floating upside down. The pre-study is estimated to be ready around the New Year 2003. A few days earlier - end September - the 'Le Joola' suffered an Estonia-like accident - and floated upside down (right). The naval architect Staffan Sjöling, M.Sc, who works with ship stability calculations at the Swedish Defence Equipment Agency (Försvarets materielverk) will assist with the pre-study. Neither admiral Rosenius nor Mr Sjöling has previously participated in any investigation about the sinking of the 'Estonia'. "We will report anything that does not tally with the official Report!" "We will report anything that does not tally with the official report", Rosenius said at the meeting 10 October 2002. Mr Michael Öun pointed out that it was an important matter of trustworthiness. In the pre-study they will also review and compare the results of earlier calculations and proposals, e.g. the proposals of the sinking presented at the AgnEf seminary 2001. One of these proposals is illustrated above, i.e. that the 'Estonia' should have floated upside down two, three minutes after losing the visor*. Therefore the 'Estonia' could not perform the events described in Figure 13.2 in (5). The question what to do with the false plot of dr Huss was apparently not discussed. Why can't the reference group discuss what to do with false, official information? Where to put the Visor? The Swedish Defence Forces (Försvarsmaken) advised that it was not suitable to keep the visor at the island of Älvsnabben (military area). Other locations were suggested; Öja (Landsort) or Bogesundslandet. Representatives of relatives and survivors (sic) shall revert with suggestions latest 15 November 2002. The next meeting of the reference group - the only way to find out what happens at the SPF - is foreseen at 13.00 hrs on 30 January 2003 when the pre-study shall be ready. The Swedish media does not publish any information at all about the new facts of the 'Estonia' today - at the request of the SPF. Strange country - Sweden. On 30 October 2002 the SPF announced that it will also make an inventory of the archives of the Swedish Ministry of Defence and the Armed Forces Headquarters about 'Estonia' matters. If this material will be included in the fact bank is not clear. On 20 December 2002 the SPF announced (ref. E 80/02) that no regular inventory of any 'Estonia' material from the Swedish police and the public prosecuter's office had been done. Furthermore it was stated that the result of the pre-study about how the 'Estonia' hull was filled with water at the end of the accident by admiral Frank Rosenius and Staffan Sjöling was not going to be ready by 30 January 2003. The reason being that further handling was required. The exact date when the pre-study will be ready cannot be stated. * It is an impossible task to show how the 'Estonia' sank according to the Commission, but the writer will give a tip to admiral Frank Rosenius and Mr Staffan Sjöling for their pre-study. QUESTION: How to explain the sinking of the 'Estonia' at 01.52 hrs based on the following official data - 4 000 tons of water have leaked into in the superstructure, 14 000 tons of water have flowed into the deck house, angle of list >70° and no water has entered into the hull compartments at 01.32 hrs because the ship is floating The reason why the ship has not capsized at this time - 01.32 hrs - is that capsize is prevented by watertight compartments in the deckhouse (sic) according to the Swedish Maritime Administration - director of safety Johan Franson. The 'Estonia' was thus floating both on the hull at 01.32 hrs and the watertight deck house prevented capsize at 01.32 hrs. TASK: Explain how the hull compartments were filled with water through a watertight deck, and, how the 'watertight deckhouse' was completely flooded between 01.32 and 01.52. Did the 'Estonia' have a watertight deckhouse as suggested by the Swedish Maritime Administration/Franson? Maybe Franson is wrong? Admiral Rosenius/Sjöling/SPF can easily check this by calling any real expert of ship stability and ask: Are there watertight compartments in a ferry deckhouse preventing capsize? Or check yourself. The writer remembers discussing exactly the pre-study task with Frank Rosenius and the SPF on 24 April 2002 - the SPF lacked detailed drawings and stability particulars of the ship. Get the drawings! Can you see any watertight compartments in the deckhouse? But Frank - you have to remember that Franson is the government expert since 1994 - can Franson be wrong? Of course Franson is wrong - he is a key player of the 'Estonia' scam. Actually - Franson is a totally incompetent, maybe mentally ill and unemployable in private enterprise? He is famous for harassing his staff to produce false information. He is one of the reasons why the 'Estonia' scam is still rolling on. So Frank Rosenius/Sjöling/SPF - my tip is - demonstrate that Franson is wrong in your pre-study. And by the way - let SPF make a press release about it. SPF knows how to deliver information.